Today is the day we have to look back. For all the happy days we spend together. Today is the day we have to look forward. For all the happy days ahead for us. Today is the day we have to Celebrate, for all the blessings God has showered on us. Happy anniversary My dear. I know that sometimes I am hard to deal with. Still, you manage to stay by my side. Thank you for just being there when I needed you most. Happy Anniversary! Anniversaries remind me of how God has been good to me. For He gave me the most wonderful man in the world. Happy Anniversary, boyfriend! We may have some quarrels and misunderstandings. But we've managed to get through them and made our love even stronger. On our anniversary, I wanted you to know how I love and care for you. I love you! We've had a lot of changes over the years. But through those years, we've grown closer together. And I hope that we stay this way forever. I love you! On this special day, I would like you to know that I am yours and my heart beats for you. I Love You and Happy Anniversary! Celebrating this day is such a wonderful experience. Because this is the day that I realize how lucky I am having the best boyfriend. Happy Anniversary! Thank you for being part of my life...For making it amazing and worth living...I hope that we celebrate more anniversaries in the future. I love you! I feel so lucky having the best boyfriend in the whole wide world. You are caring, sweet, amazing, funny and smart...Being handsome is just a bonus. Happy Anniversary! 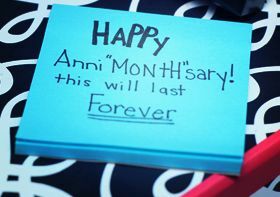 Monthsary is an important day just like an anniversary. The basic difference between a monthsary and an Anniversary is that the former is celebrated in terms of months and the latter is celebrated in terms of years. In a year, there can be only 11 monthsaries for a certain event because the 12th monthsary is nothing but anniversary. Monthsaries are also special and important events and people celebrate a monthsary of togetherness in style, too. Monthsary togetherness or monthsary of any event can be celebrated month after month by gifting your beloved something and making him feel special by cooking some delicious food. Monthsary is special tough its importance should not be exaggerated. On monthsary, you can even purchase a monthsary card or send e-cards to your beloved along with some valuables to show your love and celebrate your months of togetherness, as they keep piling on and eventually culminate into your anniversary.